Well September is almost here, and with it a new school term – and whether you have children about to start a new year, you’re studying yourself or your exam days are long behind you, there’s still something lovely about that “back to school” feel, full of new possibilities and excuses for lovely new stationery! If it’s stationery that you’re after, then turn to page 66 for Kath Webber’s fun pencil-themed pencil case, just the thing for stray pens and pencils or even your crochet hook collection! While Emma Potter’s gorgeous striped scarf (page 56) uses a lovely textured stitch for a cosy, woolly wraparound with a school uniform feel. And Hayley Joanne Robinson’s textured Tunisian jumper is the perfect oversized sweater for throwing on when the temperature drops. 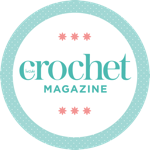 We’ve also got the second part of Sarah Shrimpton’s stunning mystery crochet-along shawl, for everyone impatient for the next set of instructions! This section introduces the gold-coloured yarn for a pretty contrast in some textured stripes and simple crossed stitches. If you’ve always fancied giving raised stitches a go – ideal for cables, ribbing and texture – then turn to page 86 for Nicki Trench’s easy-hook guide to raised trebles, paired with a fun hat in a super-soft yarn, topped with a colourful pom-pom. Ideal for when the cooler weather hits!